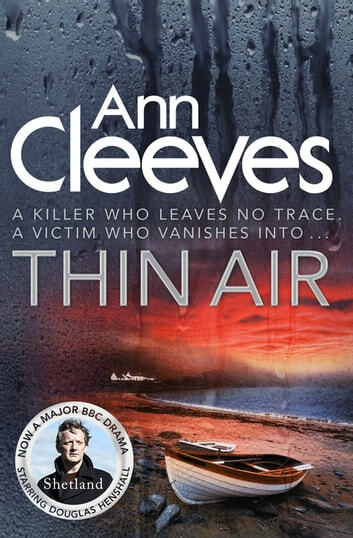 Thin Air is the sixth book in Ann Cleeves' Shetland series – a major BBC One drama starring Douglas Henshall as detective Jimmy Perez. A group of old university friends leave the bright lights of London and travel to Unst, Shetland's most northerly island, to celebrate the marriage of one of their friends to a Shetlander. But late on the night of the wedding party, one of them, Eleanor, disappears – apparently into thin air. It's mid-summer, a time of light nights and unexpected mists. The following day, Eleanor's friend Polly receives an email. It appears to be a suicide note, saying she'll never be found alive. And then Eleanor's body is discovered, lying in a small loch close to the cliff edge. Detectives Jimmy Perez and Willow Reeves are dispatched to Unst to investigate. Before she went missing, Eleanor claimed to have seen the ghost of a local child who drowned in the 1920s. Her interest in the ghost had seemed unhealthy – obsessive, even – to her friends: an indication of a troubled mind. But Jimmy and Willow are convinced that there is more to Eleanor's death than they first thought. Ann Cleeves' striking Shetland novel explores the tensions between tradition and modernity that lie deep at the heart of a community, and how events from the past can have devastating effects on the present. Also available in the Shetland series are Raven Black, White Nights, Red Bones, Blue Lightning, Dead Water, Cold Earth and Wild Fire. Love the descriptions of Shetland. Atmosphere and the setting are at the centre of the story. The story is told through the eyes of the characters, who develop along with the mystery. They are also believable. Started watching Shetland on Knowledge Network in Canada, loving the location, characters and wonderful story lines. The novels are well written and offer insight into the police methods of Shetland that differ from North American methods. Will definitely continue to read more of the Shetland series. A bit thin in plot. Enjoyable but not a mystery that inspired in depth attention. Result was not well programmed, a surprise but not a surprise that made on think, I should have looked that way. Seemed that the author want to bring about a surprise but did not program the story to reach that result. I really enjoyed this series. 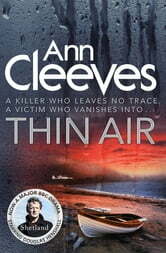 Thin Air kept me up late as I could not seem to stop reading. I recommend you start with Raven Black which is book one.